A warm muggy day at Grosmont today, with Derek Shorten, Jon Bradley, Nigel Hall & Ian Pearson. Also Gordon Wells fitting conduit and a couple of sockets in the pit. After a cup of tea a slow start was made on progressing today's work load, Derek Setting up the lighting down in the running shed and taking the equipment needed for final cleaning and painting of the L/H frames. Jon & I replaced the remaining Klinger packing top R/H. Then onto boiler dome to remove the broken stud. 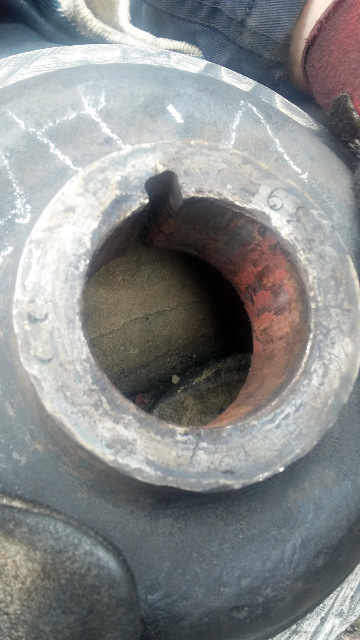 This has had a nut welded onto it, so eventually we found a socket that fitted this nut 30mm . 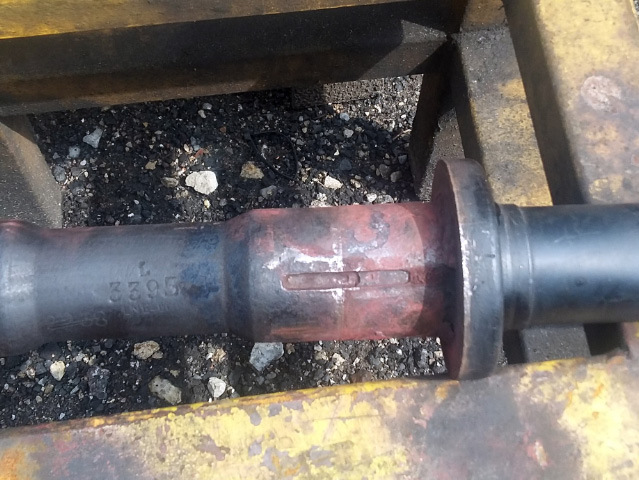 A long pipe was attached to the socket bar and after about 4 attempts to remove the stud it sheared again. I have left this job until Saturday as it may need drilling out ,plus the fact there was someone working in the boiler assisting the boiler smith tapping the flue holes in the tube plate. In the meantime Nigel got started with the painting and by the end of the day the left hand side is now all primed. Lunch was going to have been on the bench outside Deviation shed but as Nigel was about to take a bite of his sandwich the heaven's opened torrential rain came down so lunch was inside Deviation shed. The rain was hammering down and it wasn't long before it was flowing under the side door through the workshop and out into the pit. After lunch the remaining four Spring hanger adjuster bolts which Chris Parrish was re- cutting the damaged threads were brought back to the workshop and are now on the bench with the others, he still has one nut that needs some attention but will be ready on Saturday. Had a word with Piglet re NDT of the hanger bolts he is trying to get this done soon! 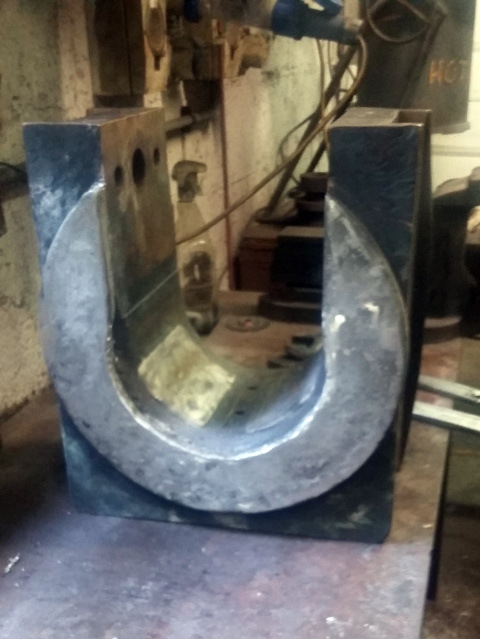 At long last the L/H back plate has been removed ,thanks to Shaun Bowler and his mate (railway fitters). it was taken to the press with about 10 tons of pressure and quite a bit of heat it eventually started to move free. No wonder it would not move the amount of rust holding it. I don't think it had been off for many years! see photo's, Jon and I started to clean the back plate and spindle still needs some more cleaning. We had a look in the White metal shop where our axle boxes are being white metaled about six are done.